With brilliant red flowers in spring, Boronia heterophylla is one of the brightest of all of the Boronias. Originally grown as a landscaping plant, it has become a favourite with cut flower growers as well. From Western Australia, the flowers are lightly perfumed and rather than red we would call them a deep pink. This is one of the easier Boronias to grow. Give it a sheltered position, a well drained soil and cool root run and it will be long lived. It is used for cut flowers, and can be pruned each year. The trick with pruning is not to prune back into the previous years growth, or into bare wood. 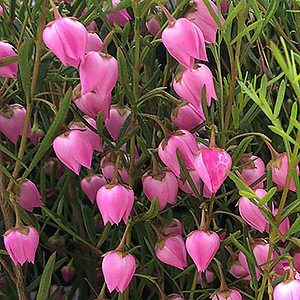 If the soil is well drained, and the plant is grown where it receives some protection from the hottest part of the day, Boronia heterophylla is fairly easy to grow. Dappled shade or afternoon shade is best. A well drained soil that does not dry out is preferred. In full sun it will require more moisture. We suggest mulching around the plant to maintain a cool root run. A little extra water during long dry periods will also be beneficial. A little native plant fertiliser in spring will help promote good growth. This is species with a fairly upright growth habit, so it can be pruned to give it a more rounded or bushy shape. Simple tip pruning after flowering will help maintain a good bushy shape. 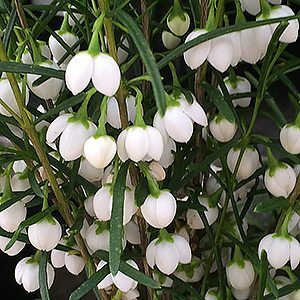 With some natural variation in flower colour, a white flowering form named ‘Moonglow’ is now also available for sale. Another named ‘Cameo’ has striped flowers. Also look for ‘Ice Charlotte’, ‘Blue Waves’ and ‘Just Margaret’. Soil Humus – Humus rich and moist with very good drainage. Flowers – Showy bells, pink to red.